Lady Diver in stainless steel, diamond dial and diamond bezel. It is a 40mm case, date indicator, y automatic movement and features a sapphire see through glass back. 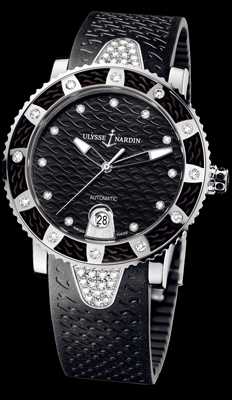 The rotor is engraved with the Ulysse Nardin name, and anchor logo. It is available on a black rubber strap.